Mikey Howard, age 46 of Park Rapids, MN, formerly of Lynn Haven, FL peacefully passed from this life into eternal life at his home with his loved ones at his side. Mikey was born on March 6, 1968 in Lakeland , FL to George and Patricia (Rocher) Turner. It was in Lynn Haven that he attended public school and grew into manhood. In 1985, he entered the United States Army where he proudly served his country as a member of the 16th Infantry of the lst Division as a Specialist Class E-4. Upon receiving his honorable discharge in 1988, he worked as a vocal entertainer and disc jockey. Mikey reentered the Army in 2008 where he served as an army combat medic. He was deployed to Iraq from July of 2009 to July of 2010 with Task Force ODIN and a second time from February of 2011 to December 2011 with CMC 215th BSB. 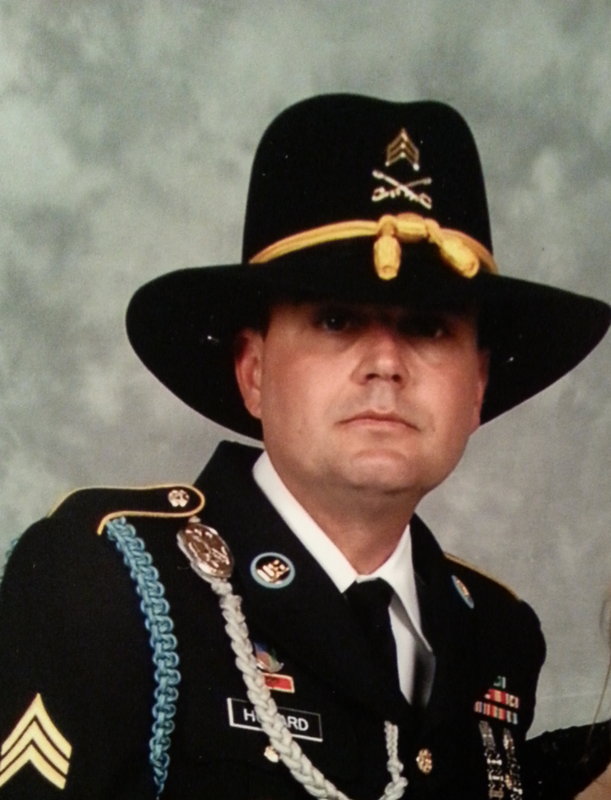 Shortly after returning home from his second deployment, Mikey began exhibiting the symptoms of Lewy body dementia; but, the army did not diagnose this terminal disease until January of 2014. His illness has helped bring to light the mistreatment of our wounded warriors. He continued being based out of Fort Hood , Texas until retiring from the military on July 27, 2014 . Mikey loved music and he loved to sing and bring joy to his many loved ones. He was a voracious reader who enjoyed filling his mind with facts and knowledge. Due to his deteriorating health, Mikey entered hospice care in September of 2014. Just recently he unselfishly moved with his wife, Robin to Park Rapids and bought a home so that she could be with her family at the time of his death. Above all, Mikey cherished the time he spent with his soul mate, best friend and wife, Robin who he loved with all his heart, soul and mind. Mikey will be lovingly remembered by his precious wife for these past ten years, Robin (Alden) of Park Rapids; his children: Christian, Abigail, Carley, Joshua, Sarah Jayne, Christina Michelle, Severin-Liam and step son Billy Barton; his two grandsons: Jaxon and William; his mother and step-father, Patricia and Lewis Howell of Panama City, FL; his two sisters: Carol Turner and Ashley Thibodaux and brother, Kreed Howell all of Panama City, FL; as well as many nieces, nephews, other relatives and many, many friends. Mikey was preceded in death by his father, George Turner in 2005. Memorial services will be held 2 PM Saturday, February 14, 2015 at the Assembly of God Church in Park Rapids with the Reverend Art Wood and Rev. Tim Wilson officiating. The organist will be Kjersten Schmid and the song leader will be Trisha Glanzer. Visitation 1 hour prior to service. The urn bearers will be: Ron Alden, Randy Alden, Joe Alden, Shannon Jay, Richard Watson and Maurice Eisenbarth. The Star of the North Marine Corps League will be providing military honors. To leave on line condolences or to view the memorial video honoring Mikey’s life, please visit www.jonespearson.com. Mikey's service will be Saturday, February 14 at 2:00 pm. Visitation will be one hour prior. It will be at the Park Rapids Assembly of God located at 208 Western Ave South, Park Rapids, MN 56470 (Half mile west of fair grounds off Hwy 34) There will be a luncheon following the service provided by the Park Rapids Assembly of God church. Be sure to mention when making reservations you are needing the Funeral/Bereavement rate. A tip for the day of the service: Mikey's favorite color is pink and his favorite flower was the daisy as well as sunflowers. Floral arrangements are to be delivered to the Park Rapids Assembly of God church as there will be nothing held at the funeral home. Saturday after the service: Akeley VFW from 6 pm to 8 pm. Sideline Entertainment (Love you guys so much!) will then be at the Park Rapids American Legion set up (back room) and ready for you to do karaoke and continue honoring Mikey's memory by doing what he loved to do the most and that is singing!